So it turns out that I am a big fan of dip, especially southwest cobb salad dip. I pretty much like to eat dip at all time, for all occasions. It doesn’t need to be a holiday or special gathering or anything. 1:12pm on a Tuesday seems like a great time. And I have been this way from the moment I stepped foot out of the shelter and security of my parents home. Living on your own is not easy, but making southwest cobb salad dip is. It’s an easy way to feel rich while sitting on a hand-me-down couch and ignoring the stack of bills on top of empty pizza boxes listening to the AOL dial into the internets. Dialed into the internet. I am old OK? Ok! 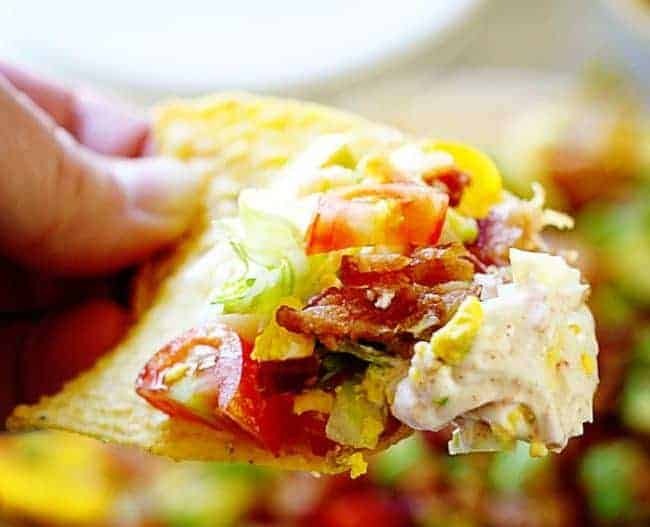 So this southwest cobb salad dip recipe is a variation of one that I made when I first met my husband many, many many years ago. I would buy a container of sour cream. Add a packet of taco mix. Then spread it on a plate. Add store-bought shredded cheese, one tomato cut up and a can of olives. It was cheap and good, but this recipe is just a little better. You can mix the seasoning right in the sour cream container but just work slowly. If you don’t mind a dirty dish, transfer sour cream to a bigger bowl, add a packet of seasoning and then spread on your serving platter. I did not add cheese to this recipe, but you certainly can! Some crumbled Bleu Cheese or Roquefort would be lovely! (just a bit tangy for my tastes). I also like this recipe with a finely grated sharp cheddar. To save time you can use rotisserie chicken, deli meat, or even left-over chicken from last night’s dinner. I used a handful of red and yellow plum tomatoes. You can also use one medium tomato chopped up, but do try to remove all the seeds. Use a sturdy chip for this sturdy dip. 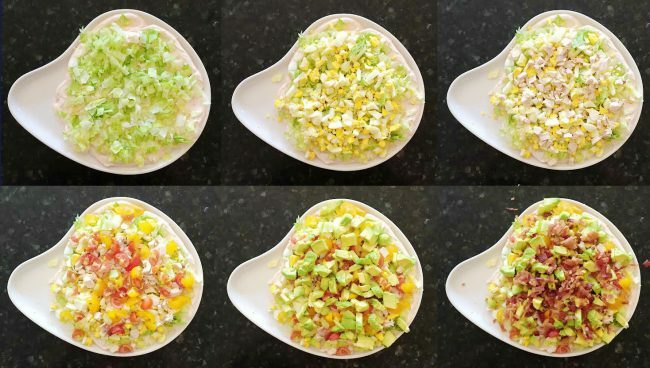 This southwest cobb salad dip recipe can easily be doubled and tripled. You can add whatever ingredients you prefer! Try refried beans for the bottom layer or black olives, jalapenos, bell peppers on top. If you feel like eliminating some of the store-bought elements, consider my homemade taco seasoning. There is really not much that is easier than plopping some perfectly selected ingredients on top of a layer of seasoned sour cream and dipping salty chips into it. It was easy 20 years ago and is just as easy today. So do it already! You won’t be sorry. Well, you may be sorry you have not eaten this until now, but you won’t be sorry you made it. I mean, you may be sorry that you made it with friends and family around so you didn’t get to eat much, but you won’t be sorry when people are begging you for the recipe and demanding that you get your own show on Food Network. It could happen. If you like this recipe then be sure to check out my taco dip and my white bean chili cheese dip as well as the SAVORY section of my blog! Lots more lip-smackin goodness! Cobb Salad in dip form, you don't know what you've been missing! Mix sour cream and seasoning (Fiesta Ranch Dip or Taco Seasoning) and spread on serving platter. 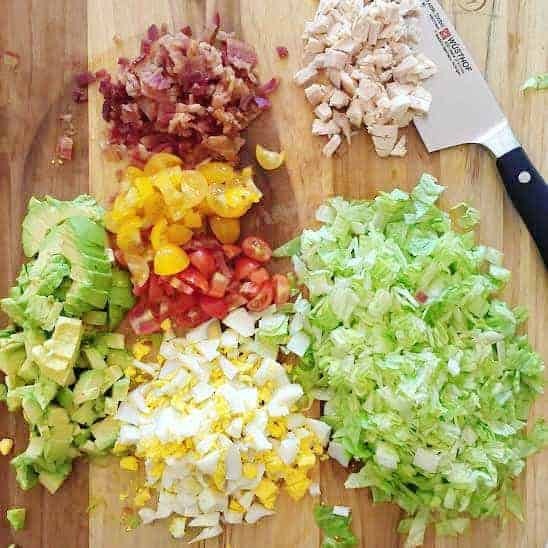 Cover with lettuce, then add the egg, chicken, tomato, avocado, and bacon. 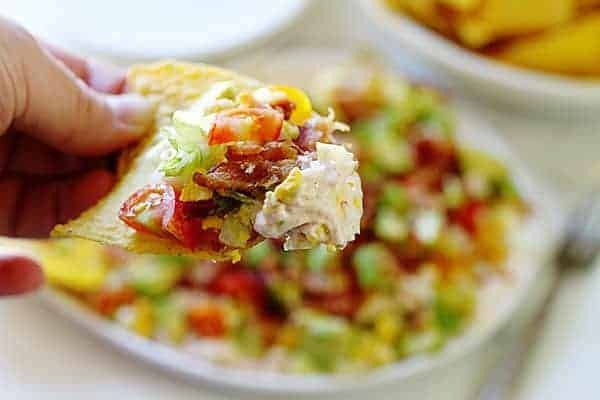 DID YOU MAKE Southwest Cobb Salad Dip? This looks so delicious! Can’t wait to try it!!! Hope you like it Laura! Dips = survival, whether it’s your first year away from home (or 54th). Love this combo too! 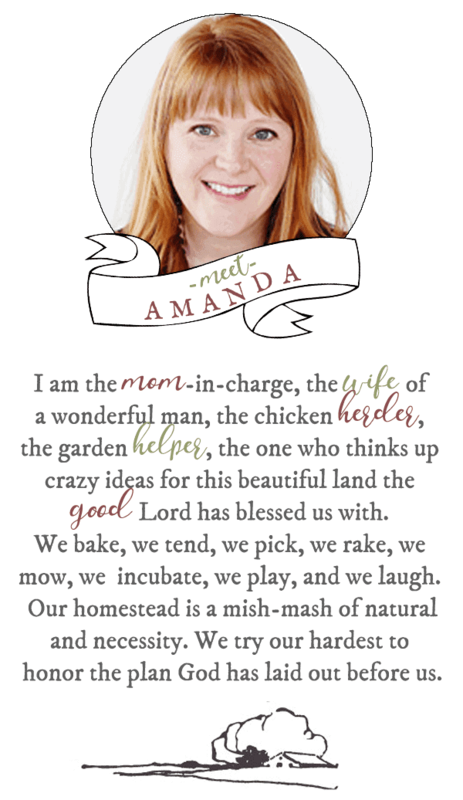 Oooh, I love this! I’m obsessed with cobb salads but I’d much rather eat it on tortilla chips! Genius! This looks sooo good! You are brilliant my friend. I don’t need an excuse for chips and dip and now I can call it SALAD! Lol…… what a Wonderful twist on a friendly favorite … !!! Thanks for a Great Recipe !!! 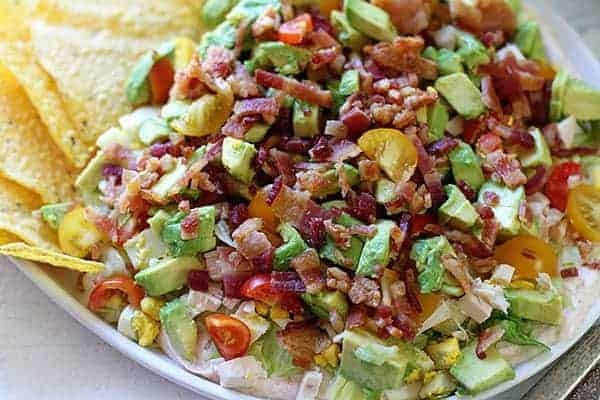 WOW.. this southwest cobb salad dip looks amazing and my husband would love it. I’ll definitely try this recipe and share my opinion about it. Thanks for sharing! This recipe looks and sounds so delicious my husband and I love to cook and try making new recipes together ….Tonight this is the one we will be trying! Looks delicious! What kind/size of serving dish did you use? 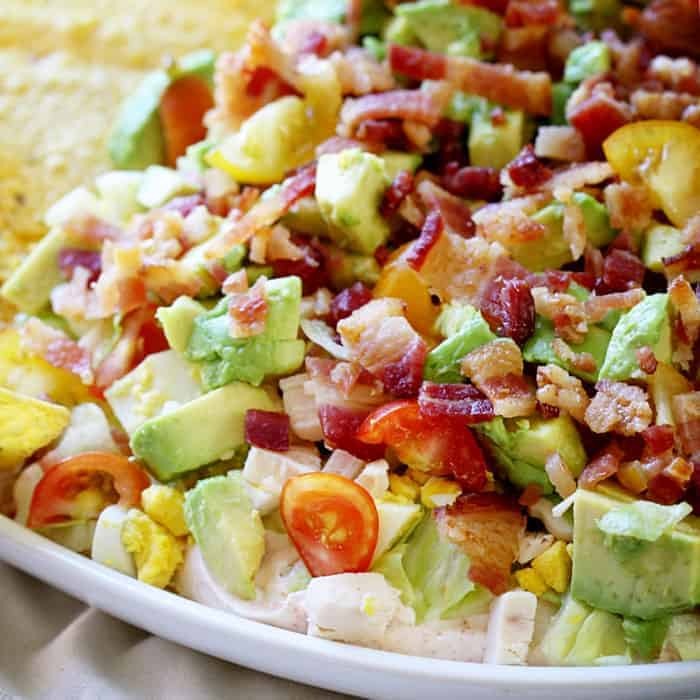 This is absolutely magnificent, scrumptious, delicious, super yummy southwest cobb salad. Thx for sharing recipe, I definitely add it to my cookbook! Why not just leave the avacado out! I am going to make this dip. I love dip. Except with Avacado! 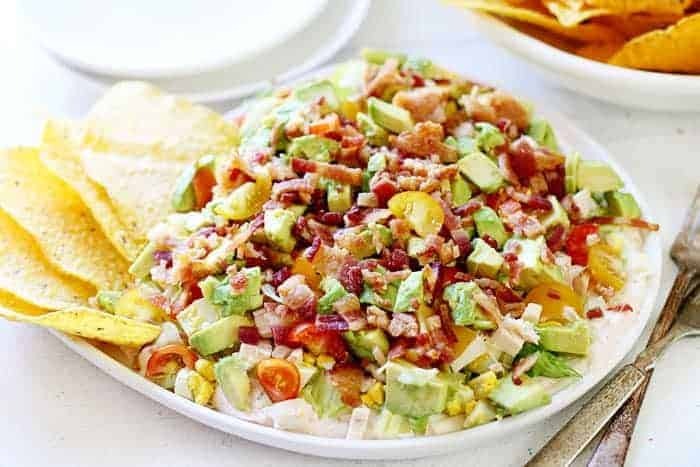 Absolutely love your creative idea with southwest cobb salad dip! Can I post it on my blog? Thanks for sharing!